On Sept, 30th, Beijing No.1 Intermediate People's Court (IPC) dismissed Futabasha's dispute with a Chinese firm (Guangzhou Cheng Yi Optical Co., Ltd.) over the trademark of "Crayon Shin-Chan." Futabasha later appealed to Beijing High People's Court. Currently Futabasha finds itself in an interesting situation, where the company is not allowed to sell its own product in China because of "Trademark Infringement." Futabasha's "Crayon Shin-Chan" is a popular title by Usui Yoshito in both Japan and China. 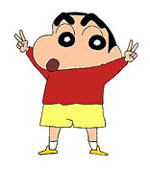 During the trial, Futabasha claimed the Chinese firm's registration of the trademark of "Crayon Shin-Chan" to be invalid. According to a spokesperson of Futabasha, the company attempted to promote "Crayon Shin-Chan" goods such as clothes in Shanghai in June of 2004; however, Futabasha was asked to take off the "Crayon Shin-Chan" merchandise from stores because of "infringement of trademarked signs." In 1997, Guangzhou Cheng Yi Optical Co., Ltd. registered 9 character and design trademarks about "Crayon Shin-Chan" products in China. Futabasha applied to revoke the trademarks in January of 2005. Later that year the Trademark Review and Adjudication Board (TRAB) ruled against Futabasha's application, which caused Futabasha to protest and sue TRAB in Beijing No.1 Intermediate People's Court. Genuine Futaba[sha] licensed Crayon Shin-Chan shoes have been removed from stores in China cited as "Infringing Trademark" by the Chinese government because the trademark had already been registered to a domestic company that copies designs. The company has demanded the cancellation of the registration of trademark to authorities in January this year. Officially licensed Shin-Chan Comics only began selling in China from 2002. Apparantly the Chinese firm succeeded in registering the trademark without permission by the Japanese rights holders in 1997. Futaba began selling the genuine licnesed goods last April in China and their goods stocks were confiscated in several places after the license was assumed to be "Infringing Trademark" in July. So Futabasha finds itself in an interesting situation, as the publisher of "Crayon Shin-Chan" can't sell its own merchandise in China. Submitted by Trademark (not verified) on Tue, 2008-07-29 13:58. This is what happens sometimes with international trademark law... strange, but true. It can be a nightmare sometimes.